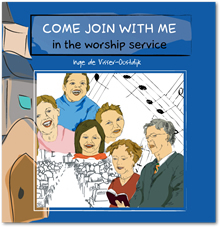 Come Join with Me in the Worship Service, Inge de Visser-Oostdijk, Armadale: Pro Ecclesia Publishers, 2008. Hardcover, 85 pages, $20.58. It’s not often that I’m asked to review books for children. In fact, I think this might even be the first time. This book by elementary school teacher Inge de Visser was written to introduce children to Reformed worship. The author wants children to understand what we do and why we do it. The book covers a Reformed worship service from beginning to end. It also includes introductory matter that covers such things as how we dress for church, praying for the minister and the worship service and how we behave when we enter the church building. Towards the end of the book, de Visser also covers such things as the sacraments, days of commemoration, the consistory, and the home visit. Overall, this little volume will be useful in teaching our little ones about Reformed worship. It could be used, for instance, in daily family worship. I gave it a trial run in our family and our children seemed to profit from it. It’s especially good that de Visser presents the material in bite-size chunks and ends each chunk with a question or two that could lead to some further discussion. However, there are a few small points that deserve mention. First of all, the book makes some assumptions about Reformed worship services that may limit its usefulness. For instance, the author assumes that Reformed churches will use an organ, that all Reformed churches practice the handshake, that there is no explicit call to worship, that the congregation does not respond vocally at any time in the service, and that there is no assurance of pardon after the reading of the law and the confession of sin in prayer. Furthermore, a younger reader may not notice it, but an older reader may pick up that the font inexplicably changes at some places in the book. Otherwise, it is a handsomely produced book that includes tasteful illustrations. There is no other book like it and for that reason alone, I think it’s worth recommending. Some sample pages can be found by clicking here. This entry was posted on Friday, January 15th, 2010 at 1:06 pm	and tagged with children's books, Inge de Visser-Oostdijk and posted in Book Reviews, Reformed Worship. You can follow any responses to this entry through the RSS 2.0 feed.